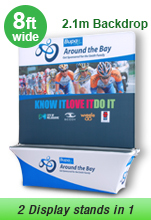 Portable Displays help you to easily transport between events! 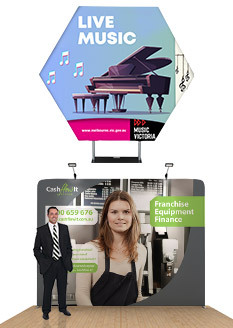 Portable displays are one of the most searched for item by businesses that regularly attend trade shows and exhibitions. 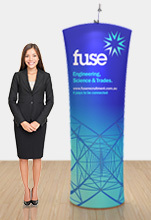 Finding the right size and style of banner stand at the price you can afford is great, but if it's going to be a huge task to bring it to or from events, is it even worth it? 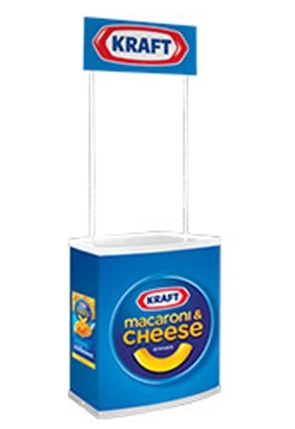 That's why our selection of items is great, as they are offered at low prices and are all completely portable to make transport easy! 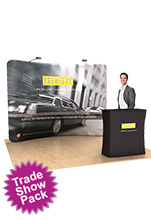 These portable displays include a wide variety of styles and products that can be used to completely outfit your booth at a trade show to really entice passersby to checkout your goods and services. 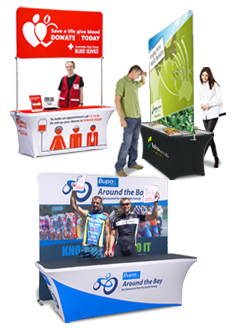 From pop up booth systems to custom designed exhibit stands, everything you could need to help turns passersby to clients can be purchased from this page! 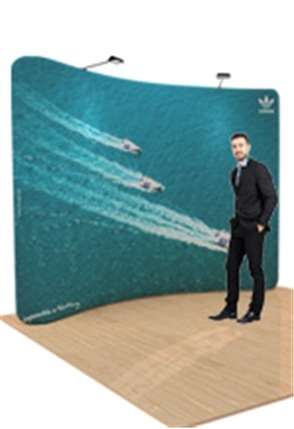 All of our displays that use your custom own custom designed graphics are digitally printed onto strong fabric for long lasting items that depict your graphics in vivid full colour for a truly eye-catching display. 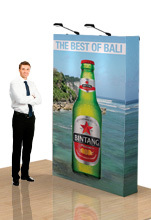 There are multiple styles of backdrops to choose from, with the wide variety of sizes making it easy for you to find the one that works best for your purposes. 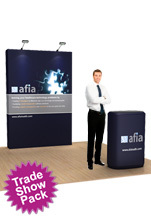 Have a large booth at an exhibition hall that needs a colourful backdrop to get attention from across the room? 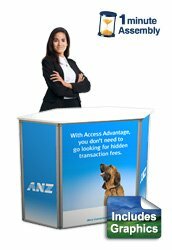 Easy, check out this popup stand that includes a greeting counter that also has graphics to coordinate with the backdrop display and offer a professional look. 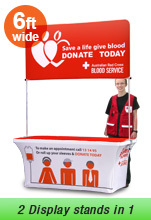 We also have smaller versions such as this display exhibit that takes up lesss space so that it can be used in retail stores or shopping centres without a problem. 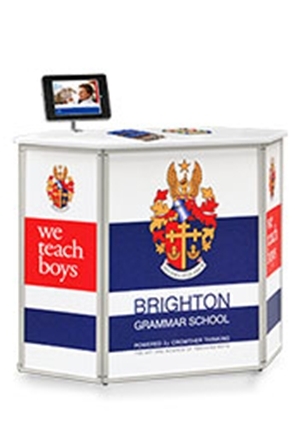 Many of the display stands have LED lights as an optional purchase as well, illuminating different sections of the stand and just generally creating a really attractive display that shows that you mean business. 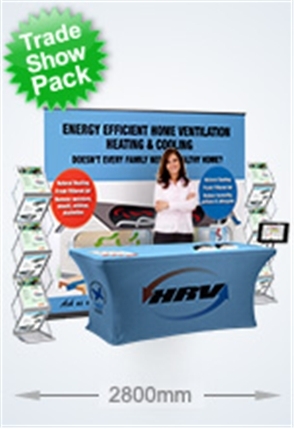 In addition to those styles of op up displays, we also offer full kits that include different styles of products that our customers have paired together to great effect at different locations. 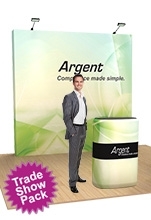 Combining different products together helps outfit your booth completely, and works like this. 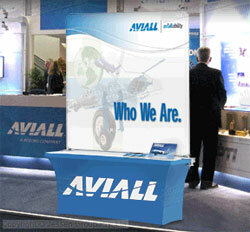 You have the large backdrops like mentioned above that have your company logo and bright coours to draw customers in. 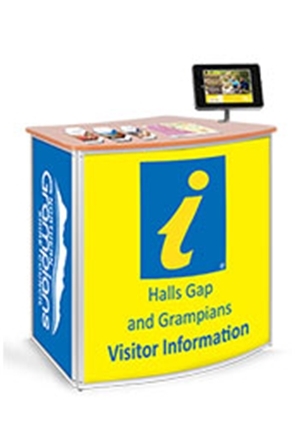 Once in your designated area at the exhibition, they can browse brochures and catalogues that are in the literature stands, or spread across your table. 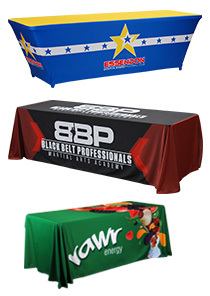 The table is not plain though, it matches your backdrop with a printed table throw that also shows your company logo and designs! 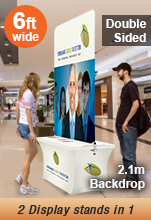 This synergy between elements will set you apart from the competition that have a sliphod booth. 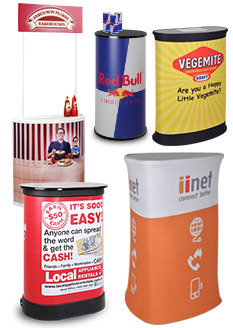 There areslo many differnet styles of greeting counters to choose from that can have graphics printed on them as well, or even be blank if your wish. 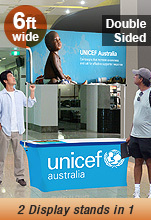 These counters features shelves within for employees to put beverages out of view or even place additional materials or merchandise. 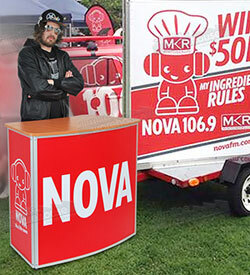 All of the items available on this page require no tools for assembly for quick set-up at any location. 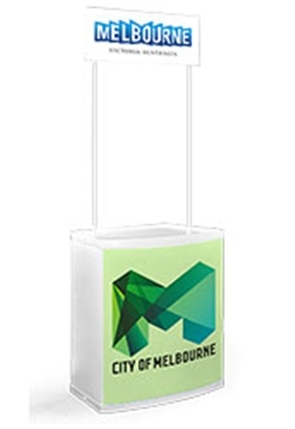 They breakdown small to be transported to and from events, and most even include a carrying bag or case that holds all the components together. These bags are even useful when in storage in between trade shows or exhibitions, as they keep grime or dust from gathering on dipslay to keep them nice and clean. 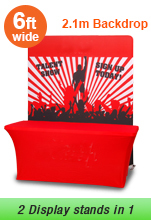 Browse the entire seleciton onw and find your next quality item for use at your upcoming events! 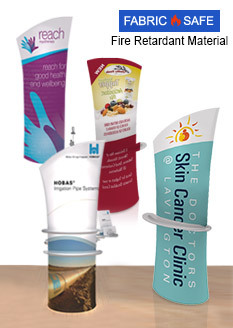 There is a wide array of products to choose from that you can utilise to outfit your business, helping you to use high quality items in every facet of your location to provides customer with a professional experience. 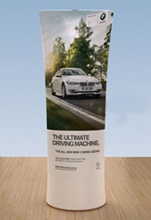 The large online catalogue has conveniently been broken down into categories that makes browsing for products that you need easier. 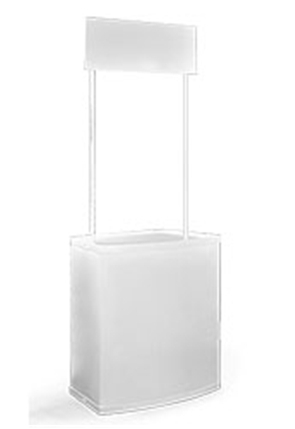 The many items we offer have been sourced from international and local vendors to ensure a wide selection of items Each product has also been thoroughly tested prior to being offered for sale in order to ensure only long-lasting items are sold that offer a great return on investment. 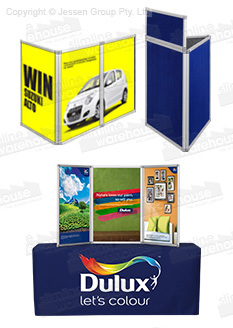 Slimline Warehouse has been in business for over 25 years, helping Australian businesses to outshine the competition by using our products that are always made of top quality materials and sold at low prices. 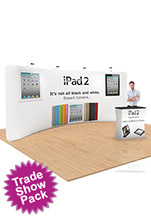 We are always on the lookout for for new items, which makes helps to provide customers with the latest trends, styles, & technologies when purchasing to get a leg up on the competition and draw customers in! 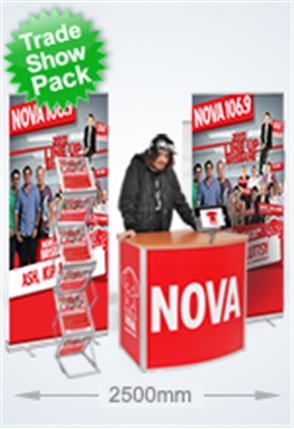 Our warehouse provides fast despatch of products to anywhere in Australia, including to Sydney, Melbourne, Adelaide, Perth, Townsville, Wollongong, Brisbane, Cairns, Hobart, Geelong, Canberra, Alice Springs, & Toowoomba!